Corporate training can be a lucrative opportunity for leading higher education institutions. Done right, an institution can improve the relevance of programming institution-wide, generate additional revenue and forge lasting and meaningful relationships with the corporate sector. Yet before your institution can seek out potential corporate partners, you must first know what you bring to the table. The US has over 6,900 accredited higher education providers, many of whom are vying for their share of this industry. And it’s not just academic institutions you have to compete with either. Throughout the country there are countless independent companies offering corporate training services. 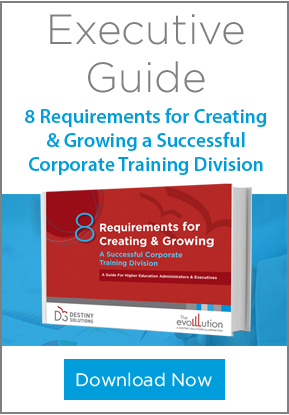 If your institution is to develop an effective, well-regarded corporate training program, it is vital that you think about what differentiates you from your competitors. This analysis is a key step when strategizing about the aims and goals of the program. So what sets your institution apart? Perhaps your brand already carries a high level of prestige that you can leverage when forging future partnerships. Or maybe your institution offers an innovative approach to teaching a certain subject area. Do you have a higher-than-average command of technology? Does your institution provide corporate partners with the best service possible? Whatever it is that your institution does best, it is essential that you capitalize on this when thinking about how you’d like your corporate training partnerships to move forward.